Doesn't this sound amazing? 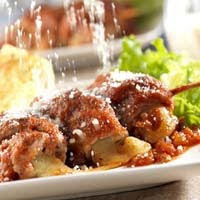 Thin slices of veal rolled around a filling of prosciutto, pine nuts and mozzarella, simmered in Italian sauce and served with garlic cheese bread. Best of all, it's ready in under an hour. Heat the oven to 400 degrees F. Stir the bread crumbs and pine nuts in a small bowl. Divide the prosciutto among the veal pieces. Top each with 1 tablespoon bread crumb mixture. Divide the cheese among the veal pieces. Roll up the veal pieces around the filling. Thread 3 veal rolls onto each of 6 (6-inch) skewers. Heat the oil in a 12-inch skillet over medium heat. Add the skewers and cook for 3 minutes on each side. Pour the sauce over the skewers. Reduce the heat to low. Cook for 15 minutes or until the veal is cooked through. Meanwhile, bake the bread according to the package directions. Cut the bread into 2-inch diagonal slices. Serve the bread with the veal and sauce. Sprinkle with the Parmesan cheese, if desired. This entry was posted on 6:15 AM and is filed under Veal . You can follow any responses to this entry through the RSS 2.0 feed. You can leave a response, or trackback from your own site.